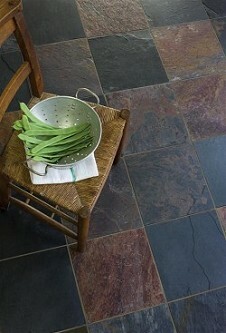 Slate tiles are durable and forgiving materials. Appropriate sealers mitigate the absorbency of fired clay. 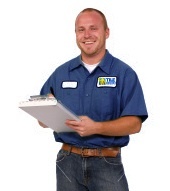 Aggressive cleaning can remove accumulated soil, but professional striping is necessary to remove old coatings and wax. 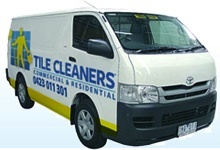 We provide specialised cleaning, stripping & sealing solutions for slate floor surfaces. A very dense, but soft and easily scratched material with low porosity, slate can be used effectively outdoors as well as indoors. Slate is a foliated metamorphic rock which is derived from shale and consists mainly of grains of mica and quartz. Excellent exterior paving stone. Higher absorbency varieties are not suitable for exterior areas in freezing climates. Most slate is gray to black, but the rock may be red or purple, depending on its mineral content. The surface of slate is generally uneven and cleft planes can spall, due to the cleaving of the stone along its layers. Has low to medium absorption of oils and other liquids. Should be sealed with an oil-repellant penetrating sealer to prevent staining and reduce soiling. Because of the cleft planes and strong possibility of spalling, it should never be cleaned at pressures above 800 PSI and then only if the grout is in good condition. Cleaning Slate Tiles can present some difficult challenges due to the many varieties of slate and the fact that Slate Tiles are often sealed with topical water or solvent based sealing products. It is important to test the slate surface before any cleaning procedure takes place. It is important to understand what type of sealers were used on the slate before any cleaning process can take place. There are may types of slate tiles originating from many places around the world and the slate tile cleaning process can vary depending on the type of slate tile being cleaned. Before cleaning slate you should test the slate surface to be sure that the cleaning product will not damage or discolor the slate surface. Alkaline cleaning products are generally safe for cleaning slate but cleaning slate with acidic based cleaning products could potentially damage the slate tile surface. Slate is a porous stone tile and there are many different types of impregnating and topical sealers that are used to seal slate. If the slate tile appears to have a topical sealer on it then the sealer needs to be stripped off before any cleaning process can begin. It is also helpful to find out the type of sealer or wax that the floor was previously sealed with to be able to use the right product when stripping it. Slate is quite dense, but it is still highly porous - a tablespoon of water left on the slate for about 30 minutes will leave a deep mark. Slate should definitely be sealed to keep it looking good for a long period of time. Since slates tiles can naturally look kind of drab but there are various sealing solutions designed to enhance the color and apply a glossy finish to them. There are three main types of sealing options available for slate tiles. An impregnating clear sealer will protect the slate and grout from water based and oil based stains. You probably can see how porous natural slate is just by applying a drop of water to the slate surface and see how the slate absorbs the water. You can imagine how any type of water based stain will be absorbed by the slate tile surface and also the grout. Therefore an impregnating clear sealer will protect the slate surface from absorbing stains and make it easier to clean the slate and the grout. Both water based sealers and solvent-based sealers can be used on slate. However, unless needed for a specific reason, we always recommend using water based sealers as they are do not produce smelly fumes on application and removal, and they are a lot easier to apply and remove, and take less drying time. In fact, solvent-based sealers are now banned in many parts of the world, including most of Europe. It is however important to know which type of water based sealer to use on your slate tile, which also depends on wether they are inside or outside, as most sealers will not last long outside as they are designed for internal use. 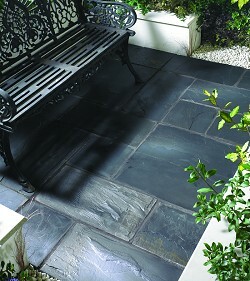 So if your slate is outside, it is important to use a water based sealer that is specifically made for outdoor slate. You should always ensure that the tiles themselves are completely clean, before you attempt to seal up the tile. This will protect the appearance of the tile, and help to be sure that there won't be any dirt or other debris caught under the layer of sealant. There are two types of impregnating clear sealers, Water based clear sealer & Solvent based clear sealer. In the past solvent based sealers were used as they used to absorb deeper into the slate and grout and used to last longer. However today with all the new advanced types of quality water based sealers available in the market, it is reccomended to use water based sealers only, which typically have less of an odor when applying and removing. Applying a solvent based clear sealer can be much more difficult to apply and can cause major problems if applied incorrectly, and is also alot harder to remove. We reccomend the use of water based sealers in most cases. At TileCleaners we generally recommended to our clients the application of a water based sealers to their slate tiles and grout. To provide premium protection from oil and water-based stains, maintain the look and slip resistance of the slate and prevent damaging moisture from being trapped within the stone, it is important to seal slate with a high quality, invisible, fully breathe-able impregnating sealer. Our Slate Floor Restoration service will bring back your slate tiles & grout to its best possible condition, and protect them for years to come. Slate can be well maintained if a proper maintenance cycle is put in place from the point of installation. Due to the lack of calcite in its composition, slate is resistant to acid. Problems can still arise however if the slate is very porous, as some can be, in which case the application of a good quality penetrative sealer is an absolute must. If the slate is honed or polished the issue of scratching will have to be more seriously addressed. Barrier mats will serve to trap abrasive soil before it is walked onto the slate. After you have cleaned your slate tile surface you may notice that the grout is still not as clean as you had hoped for. It may be necessary to do some extra scrubbing on the grout lines with your scrub pad. Just be sure to test the cleaner on the slate to be sure it will not damage or discolor the slate tile surface.